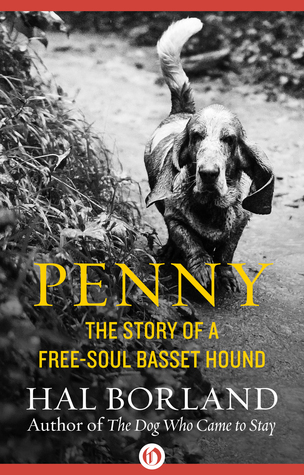 Previously, Hal Borland told us the story of Pat, The Dog Who Came to Stay. Penny is more, "the dog who came to visit." Hal and his wife Barbara are outside their home in Connecticut in a still cold and snowy late winter when a basset hound neither of them knows turns up. She comes and goes, and then seems to settle in. They can't find an owner. And while they say they don't want another dog, they name her Penny, buy her a collar and leash license and dog food, and start teaching her the rules of their house. Then a neighbor in their little town writes a story for the local paper about "the new dog who came to stay" with the Borlands. And now, they get a phone call from a family that thinks Penny may be their own missing Pokey. She is, and Pokey-Penny returns to her owners. For a while. But she's a wanderer, and wanders again. And when her owners chain her in the garage, well, that doesn't work out well. So she returns to the Borlands, who allow more wandering, and don't chain her, and don't have little kids who behave badly around dogs. 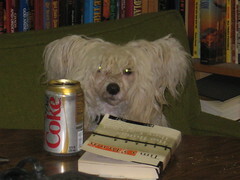 But she remains a wanderer, and she chases cows, goes nuts at the sight of streetsweepers, or horses, or pavers. It's a stress on everyone, and a dog who chases cattle risks getting shot. The Borlands turn to Sylvia, a basset-loving acquaintance over the state line in Massachusetts, who has advised them on Penny before. Penny is a sweet, but definitely free-spirited dog, who will only ever be a guest in any home. You'll enjoy getting to know her.